 Some city folk find that country life is not without its share of troubles, just as Murphey's account--though infused with considerable charm--also has some problems. 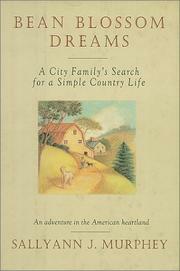 Many of us dream of shucking off a hectic urban existence in favor of a ``carefree'' country life. The Murphey family acted on their dreams. Sallyann, a print and broadcast journalist, her photographer husband, Greg, and their five-year-old daughter, Charley, trade the confines of their Chicago home for a 22-acre farm in Brown County, Indiana. One moment they're in their apartment in Chicago; the next, Sallyann is talking to a horse in Brown County. The book is stingy with transitions, creating a disjointed effect. And as the Murpheys begin to restore Bean Blossom Farm and grow their own produce, we're left without a clear sense of their goals and struggles; as in nature, all the events in this book happen pell-mell. Sallyann announces, ``It's been fifteen months since the Big Move, and we all have learned and changed a lot.'' But she offers only a few details of this period, glossing over a time of huge psychological--as well as physical-- dislocation. But this incoherence is offset by lyrical, humorous writing that traces some of the Murpheys' rites of passage and their farm's transformation--as well as Sallyann's into gardener, herbalist, cheesemaker, poultry breeder. A colorful cast of characters, both human and animal, inhabits the book. In the spirit of Elizabeth Marshall Thomas, the animals have complex lives and psyches: Horses are ``appalled,'' dogs ``mourn,'' bulls grow ``lovesick.'' And a majestic buck teaches Sallyann about strength and survival, becoming a symbol for the will to persevere. Despite its structural and stylistic flaws, this book provides a pleasant rustic excursion, complete with recipes to tease your taste buds.